Many patients are unable to recover from the impact of this treatment. That is a crucial reason why doctors need to be sure about the wavelength that the patient’s condition requires. But there are other side effects that you should know before undergoing the treatment. Infrared heat therapy, also known as infrared radiation is a treatment process where electromagnetic radiation is used to reduce pain and inflammation, and also improve the mood of the patient. This procedure is often used on cancer patients to destroy the carcinoma cells. FIR wavelength ranges from 3000 – 100,000 nanometers, IR ranges from 810 – 3000 nm and NIR ranges from 700 – 810 nm. The differences in these wavelengths have caused the infrared radiation to have different effects, and that’s why their medical uses also vary. Although infrared heat therapy is very popular across the world due to its multiple benefits like reducing inflammation, speeding up wound healing, treating cancer, improving exercise, recovery, and circulation, protecting the heart, treating diabetic complications, improving your mood, and treating hay fever, there are several significant side effects that many people are not aware of. The infrared heat can only penetrate 4 cm into your body. So, the main side effects related to this treatment are associated with your eyes and skin. However, it does not primarily contribute to skin cancer. 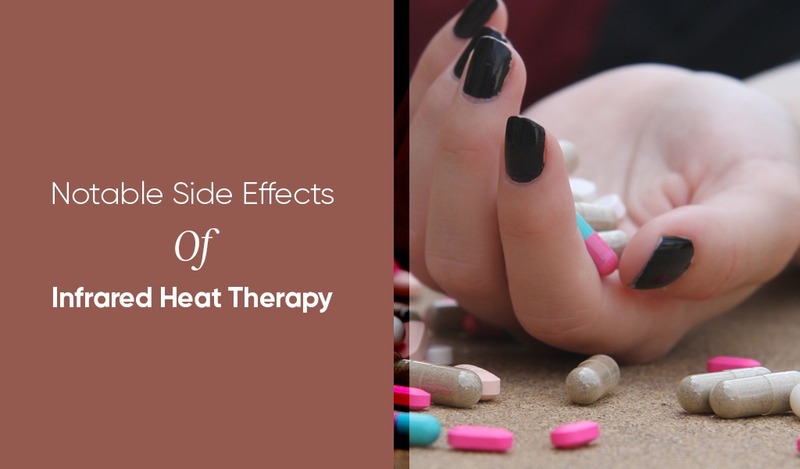 Before looking into the human side effects, you should consider the harmful consequences of infrared heat therapy to the environment. The sun’s rays have a significant amount of radiation that the clouds and earth’s surface absorbs and re-emits them back out to the atmosphere. This is the standard procedure of how natural greenhouse effect works. But with increased infrared radiation treatment, the air and clouds above the earth’s surface have a high amount of nitrogen and sulfur oxides, chlorofluorocarbons, and water vapor. When these accumulate inside the earth’s atmosphere, the infrared radiation also traps inside. This leads to an increase in temperature and change in the weather conditions that is harmful to animals and humans. Infrared radiations are always dangerous to your eyes. The electromagnetic rays can cause serious injury with sufficient concentrations that may damage your eyes forever. Since these rays are incredibly intense, they are more like to harm the eyes first because they are more sensitive than other parts of the body. As infrared radiations are invisible, it is difficult to understand if it is affecting the eye at the time of the treatment. That makes it even more harmful because there is a constant guessing game going on, and you are not sure about the consequences of the procedure until it is complete. The infrared radiation basically increases the internal temperature of the eye and virtually bakes it. Prolonged exposure of these rays to the eyes can lead to retinal burns, corneal ulcers, cataracts, and permanent blindness. Many doctors take precautions before starting the treatment. There are protective gears that prevent the rays from affecting your eyes. If the eyes absorb a high-intensity infrared beam, they may be irreversibly damaged. The doctor responsible for providing infrared heat therapy will cover your eyes with anti-radiation equipment. Most of the infrared lasers used to treat patients come with a specific wavelength. The protective gears are made according to these wavelengths so that they cannot penetrate the material of the eye cover and damage your eyes. The infrared radiation can penetrate the human body into the dermis before absorption. As much as 65% of the rays can get inside your skin during the treatment, and this can be fatal for your body. You may have seen people who are exposed to sunlight for long hours have wrinkled skin. This happens because the skin tends to become loose due to the constant ultraviolet rays. The same thing happens when you go for infrared heat therapy. There is an increase in photo aging that leads to wrinkles and fine lines on your skin due to the infrared rays. Ultraviolet radiations that emit from this treatment are the primary contributors to photo aging. Additionally, when there are infrared radiations, they also add to the photoaging process making it a deadly combination for your skin. This decreases the elastin and collagen production in the skin that ultimately leads to wrinkles. The skin temperature increases to a great extent when you undergo an infrared heat therapy. This automatically limits the production of elastin and collagen. Apart from reduced collagen production, the skin can have induced heat shock that can lead to a creation of reactive oxygen species. These inflict severe damage on the DNA through oxidation. Another problem with infrared heat therapy is that when your skin is exposed to infrared radiation for long periods, it tends to damage the new blood vessels, and also the existing ones. The migrations of the skin cells and the unusual growth are a challenge to the changing conditions of the skin. This is not acceptable, especially when you are undergoing such a crucial treatment. Patients who have already undergone infrared heat therapy have mixed reactions to the treatment. Like chemotherapy, this treatment has both pros and cons, but when you compare the adverse effects to the benefits, it is tough to decide which one outweighs the other. For now, experts believe that with protective gears and various precautionary measures, the infrared heat therapy is still acceptable provided the wavelengths suit the patient’s body. That is why you need to contact an experienced professional who can assess your condition and then offer the best treatment possible. Always inquire if your skin and eyes will be protected during the procedure, and the precautions you need to take during your recovery period. The treatment may be successful in driving cancer and several diseases away, but the side effects are also tough to ignore when there are such significant ramifications. The use of infrared heat mattress is FDA approved and it is virtually safe to use without any adverse side effects. This article shows that if you use other forms of infrared radiation it may lead to unwanted side effects.